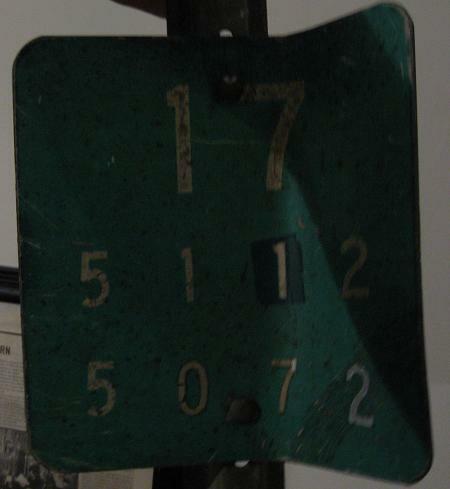 From Mike Traverse's sign collection. Below: from John Krakoff's sign collection. Definition of terms: Quickway is between I-87 and Binghamton (the quick way to get there), and the Southern Tier Expwy. is from there (at I-81) on west. NY 17 drops down to the surface as a two-lane route. It then grows to four lanes and picks up Orange Turnpike from south of Harriman to Hillburn. This surface part is eventually to become the only piece of NY 17 left, unless NY 32 takes it over. I-86 overlaps NY 17 from Corning on westward so far, with another seven discontiguous miles newly designated east of Binghamton. 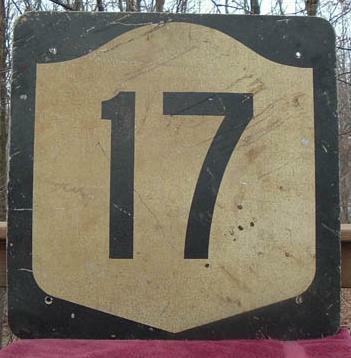 As 17 gets upgraded in a few critical spots (such as in Horseheads), that designation will move eastward (see the I-81 page for a shield that jumped the gun), until the exit from I-87 to NY 17 and US 6 is no longer just a reference route. The Southern Tier refers to the lower half of the western prong of New York. Final note: Like NY 7, the lion's share of NY 17 is signed east-west. Only the surface section is signed north-south, but when I-86 is completed, that will be all of NY 17 unless NYSDOT takes a hint and re-signs NY 17 over the original surface roads.